South County Assistance Network (SCAN) was established in May of 1997 for the purpose of providing supplemental, nonperishable food to those in need in the area. 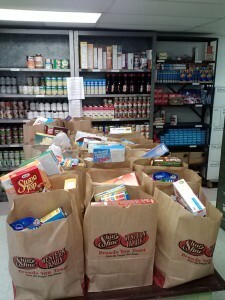 Currently the SCAN food pantry is distributing over 1,750 packages of food to 350 families annually. The pantry is located in the lower level of the Education Building at St. James Episcopal Church in Lothian, Maryland. Food is distributed on Thursdays and Saturdays from 9am to 12pm, excluding holidays. Bags of mostly nonperishable food are handed out based on household size. Eligible families and individuals may receive food once every 30 days. SCAN is not a function of St. James Parish; St. James generously provides operating space to the pantry. SCAN is a separate entity, incorporated in the State of Maryland, with a 501(c)(3) federal nonprofit, tax-exempt status. SCAN is staffed and operated by volunteers. Food is provided by the Maryland Food Bank, the Anne Arundel County Food Bank, businesses and individuals. Food is also purchased as necessary using funds donated to the Pantry. We gratefully accept donations and welcome volunteers. A HUGE thank you to Teri Leisersohn, owner of Second Wind Consignments in Deale. For over seven years Teri sets aside a portion of sales for SCAN. To date she has donated over $7,000. Second Wind Consignments is a Deale staple. Stop by – you will always find something you like, want or need. Maybe all three!